A much-lauded North Carolina collision repair program not only has a waiting list, it’s so popular it will grow into a vacant building nearby, the Fayetteville Observer reported Tuesday. 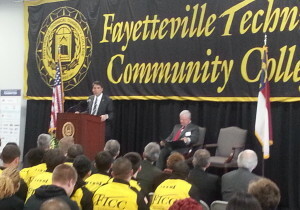 Fayetteville Technical Community College, which appears to be the Ivy League of auto body vo-tech, held a grand opening in February 2015 attended by dignitaries from the auto body and insurance world, as well as Republican Gov. Pat McCrory. Its first class, known as “Team One,” should graduate this year. The existing collision repair building is 25,000 square feet. It has two frame alignment systems; an aluminum clean room; two frame alignment systems, waterborne equipment and a waterborne paint refinishing system; welding options running the gamut from smart MIG for aluminum, silicon bronze and steel to squeeze-type resistance welders to nitrogen plastic welders. It’ll shift introductory students over to the vacant Mae Rudd Williams School facility in Spring Lake, N.C., with classes beginning March 8, the Observer reported. That allows for more room for advanced students at the existing, $4 million-plus Fayetteville, N.C., site, according to the newspaper. That nearly doubles the space of the collision repair program. “That’s keeping the college on the right track, one that emphasizes job training and economic development,” the newspaper wrote of the collision repair expansion. Gerber Collision & Glass guaranteed positions for the “Team One,” and other employers are doing so as well, FTCC had said. In June, the Observer reported Keen told the Cumberland County Commission that one company said it would take the initial 10,000 collision repair alumni, and another said it could hire the first 20,000 completing the program. Program Director Paul Gage wouldn’t say which companies made the statements about hiring, but he said the school has enough commitments from companies all over the country to provide jobs for the program’s graduates for the next 10 years and beyond. “Companies have discussed hiring large numbers of graduates even to the point of hiring entire graduating classes as teams,” he said.